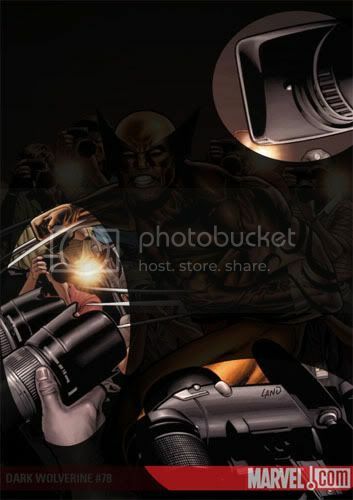 So here is the cover to the latest DARK WOLVERINE! Ok I don't read this title so maybe something has changed in relation to the Dark Regin storyline but why is Wolverine's middle claw coming out the top of his left hand and out his wrist in on his right? They are supposed to be that way. I get that superheroes are supposed to be all strong and have bulging muscles. 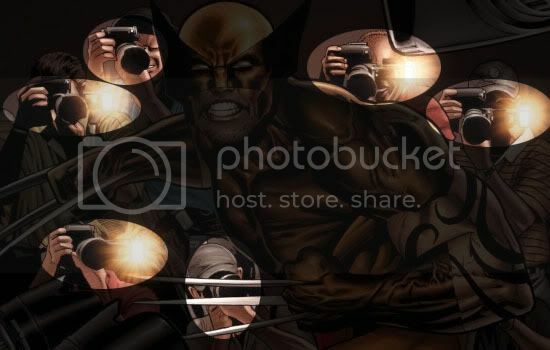 What kind of costume is Wolverine Daken wearing here? It is so tight you can see every facial scowl, bulging vein and muscle. It looks like one of the body paint costumes where you are actually naked. Take a close look at his leg. The costume stops on his upper thigh. 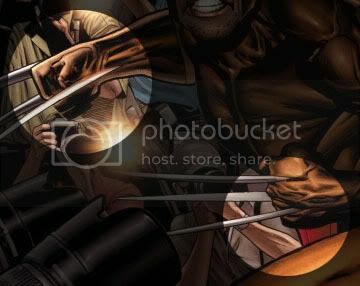 Wolverine Daken appears to be going commando and is letting it all hang out. Ah. The dreaded paparazzi!! 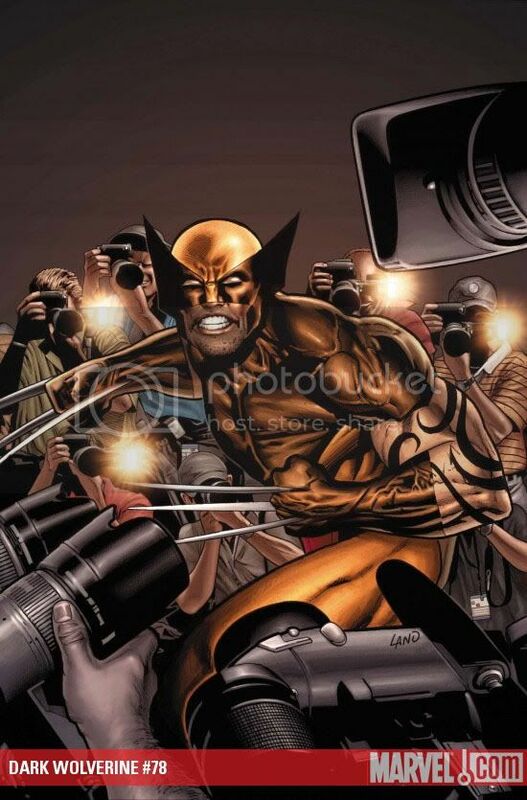 So Daken is being attacked by camera men who all have the same camera that can only be operated side-wayz (gangsta style). Exactly how are they operating the camera? None of their hands are near the shutter buttons. Aren't most camera shutter buttons on the top right side of the camera? Do they make cameras with the buttons on the back bottom corner of the camera? Speaking of cameras what the hell is that in the bottom right corner? What is protruding from the body of the camera. Take a look at the set up on the right. Apparently that camera guy has camera binoculars and where exactly is the upper camera guy standing? See that signature? Looks like "Land". If that's Greg Land then this is all that really needs to be said. But I'm willing to admit I may be mistaken. yeah I don't know about the tattoos. I don't read any x-titles so I have no clue. I judged this one solely on the cover. Yeah it is Greg Land. I have seen that thread and I think this was the first time I had really seen any of his covers. HOWEVER. 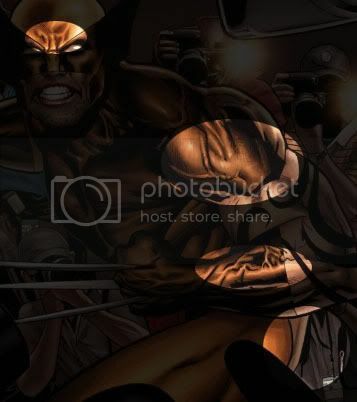 After doing a search on Dark Wolverine, it appears that the character does indeed have his claws coming out of his wrists, and so the tattoos are probably supposed to be there as well. Mine's in better condition than that one though. He looks like The Leader. Ok we can let Land off with the middle claw. But the rest still stands! Also Greg Land is a tracer. I don't care if its canon... That wrist claw thing looks really stupid. Yeah, well... I'm with you on that. 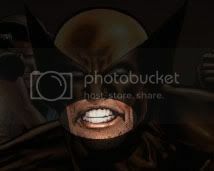 'Course, I'm also of the opinion that the character Daken himself is kind of a lame idea. Also, what the hell is up with that one photographer's hand? It looks like he's got some kind of flipper for a forearm and the lens is protruding straight through it. Ha ha! I didn't really notice that. 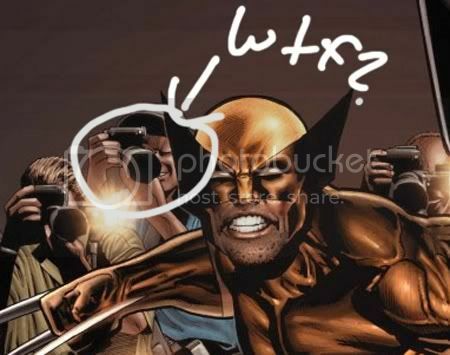 Look at the camera man behind Daken's left claw. He has a camera for a face. I think Cameraface Man should get his own Dismarvel movie!